How do you spend down your home? Retired homeowners likely have some equity in their homes that is actually a large "asset" that they don't think about, or consider valuable in any way. However, for most clients, their home equity is a large asset that should be evaluated and considered as part of their overall "portfolio." Think of your home’s equity the same way you would think about an IRA. They are both assets that are available for withdrawals. Spending down your IRA is easy to understand and to execute, but how do you spend down your home? There are three common strategies to spending down your home, including downsizing to free up equity, taking a traditional home equity line of credit (HELOC) for spending, and establishing a reverse mortgage. In this article, I will only focus on the misunderstood and maligned reverse mortgage. More specifically, I will only refer to the Home Equity Conversion Mortgage (HECM), which is a federally regulated and an insured loan program overseen by HUD and the FHA. Almost all reverse mortgages are HECM’s these days, therefore, I will use the terms HECM, and reverse mortgage interchangeably for this article. I will provide a high level overview of how a HECM works, and who would be the best candidates for one (which may surprise you). I will need to skip important details and considerations, so don't make any decisions based upon this one article. Instead speak with us and a qualified specialist in this area before taking any action. The easiest way to understand a reverse mortgage is to compare it to a similar product that is widely understood – the home equity line of credit (HELOC). Think of a reverse mortgage as similar to a regular HELOC where you can access equity funds as desired - lump sum, monthly payments, or draws as needed. Like a HELOC, a reverse mortgage can be taken in the form of a line of credit. Therefore, let’s call this a RELOC (REverse Line Of Credit). Unlike a HELOC, with a RELOC you don't pay the loan back over time via regular monthly payments. Instead, no monthly payments are made to the bank (unless desired) and the loan balance and interest accrues over time. The bank is paid back within 12 months of when you leave the home (usually due to death or a move to a nursing home). Since most of us understand how a HELOC works, the table on the first page, which compares and contrasts a HELOC to a RELOC, may be helpful in better understanding reverse mortgages. Let’s consider a simple, yet typical, example with a 75 year old client who has a home worth $350,000. They can open a RELOC with a $175,000 credit line available to use as desired over time. They may use some of it to make home modifications, or pay in-home care expenses later in life. The credit line grows over time (with the rate of interest charged), and they withdraw the funds as desired and never have to make a payment to the bank. Then, after their death, the heirs inherit the house, sell it, and receive the remaining equity (after paying back the loan and accrued interest). Below is a visual of two important differences between a HELOC and a RELOC. First, RELOC grows over time while a HELOC is fixed. Second, it continues as long as you remain in the home while a HELOC has a set duration, such as 10 years. While it is easiest to think of the reverse mortgage as a line of credit (RELOC), in fact you can spend down your home equity by not only taking a line of credit, but also by taking a lump sum, or even a monthly income stream (or some combination of all of these). As you can see, a reverse mortgage turns the value of your home equity into usable cash, but without the cash flow burden of having to make payments to the bank or the need to move and downsize. The cash from a RELOC is incredibly flexible and can even be used to pay off an existing mortgage in order to stop those mortgage payments altogether. Reverse mortgages do have a bad reputation thanks to slick TV commercials and irresponsible lending, (and borrowing) which has resulted in misunderstandings and to outdated conclusions regarding this product. However, as a result of policy changes designed to ensure the borrowers are appropriate for the product, the worst-case events have declined. Now, reverse mortgages are not only more attractive, but recent research has shown how the proper use of reverse mortgages helps retirees better manage cash flow and improves their financial security. Who is Eligible to Take & Keep a Reverse Mortgage? To be eligible for most reverse mortgages, the youngest borrower must be age 62 and your home must be your principal residence. Unlike a traditional mortgage or HELOC, there is not much in the way of income or credit requirements other than to ensure the borrower’s ability to pay property taxes, home insurance, and basic maintenance, etc. If you think about it, income requirements are less relevant since you don’t have to make any loan payments to the bank. Assets are irrelevant since the loan is backed by the value of the home. Finally, there is a mandatory 1-hour telephone counseling session to help stop inappropriate borrowers from taking this type of loan. 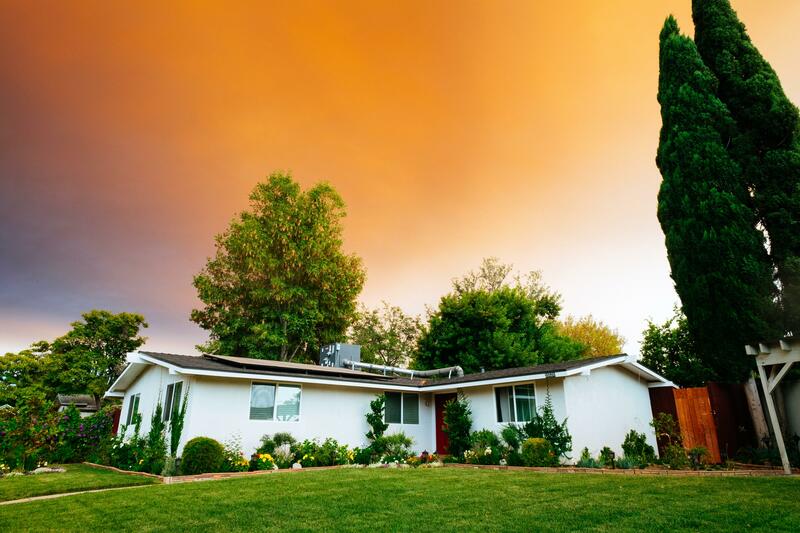 To maintain the reverse mortgage (i.e., not be required to pay it off), you must continue to reside in the home as your primary residence, and keep up with the needed homeowner’s insurance and property taxes. In addition, the home must be maintained in “good repair.” In other words, the mortgage is due when you stop living in it, don’t maintain it, or fail to pay taxes and insurance. Will a Reverse Mortgage Enhance My Standard of Living or Increase My Wealth? Ideally, retirement income planning is done with the goal of maximizing a client’s lifestyle without risking their financial security. However, recent research suggests that not only does the RELOC provide more cash flow for spending, but it actually can also lead to a larger legacy for heirs if used correctly. This is done by considering both investment accounts AND home equity. Unfortunately, most financial and investment advisors only concern themselves with investment accounts. Old school thought on how to consider home equity in retirement was to preserve it as a last resort, and if it was not needed, then the home would go to heirs or charity. However, recent objective research has shown that instead of using the home as an asset of last resort, strategically spending the home equity down over time will likely result in greater total wealth. In my video The Real Retirement Risk, I discussed one of the biggest risks facing a retiree were large portfolio losses early in retirement (also known as “sequence of return” risk). Think how a RELOC could mitigate this risk. If at age 62, you took a $200,000 RELOC (just to have the funds available if needed) and at age 65 you retire with no pension and the intent to defer collecting Social Security until your age 70, this leaves you with a 100% reliance on your portfolio. Since your portfolio is composed of some stocks, it is also subject to fluctuations. If at age 66, the stock market begins a 12-month bear market and takes several years to recover, imagine the value of having that $200,000 RELOC to withdraw from while the market is down. Better yet, since you don’t have to take taxable IRA withdrawals, you may now have the option to perform valuable Roth IRA conversions. Once the market rebounds, you may even elect to pay off the borrowed amount (and interest). In other words, a RELOC can be a very effective method of mitigating sequence of return risks, managing taxes, and generating tax-free income as desired. Reverse mortgages are often more effective if opened and used strategically early in retirement, rather than as a last resort. This is especially true in a low interest rate environment. (Pfieffer, Schael, and Salter, 2014). Coordinating withdraws from a RELOC when investments like stocks and bonds are down, so the client can ensure a steady income while giving the investments time to recover can significantly increased clients’ financial security – as measured by Monte Carlo Success Rates. It was also found that reducing portfolio withdrawals when markets are down by using a RELOC as a bridge is an effective method of mitigating sequence of return risk. (Sacks & Sacks 2012). 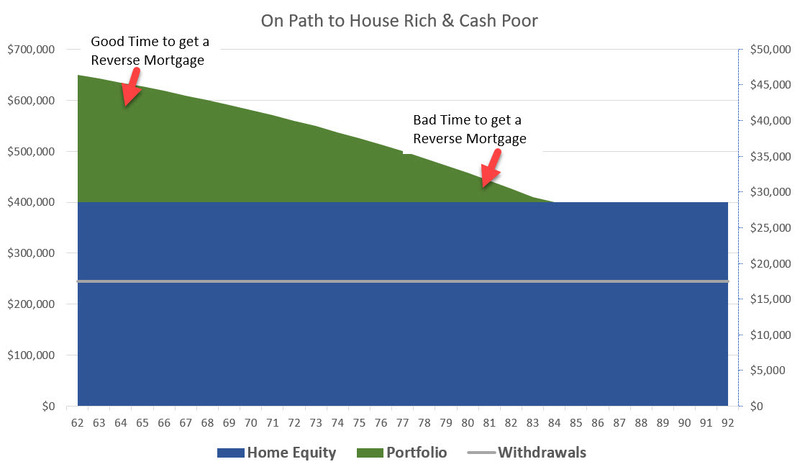 In one study, six different reverse mortgage strategies were evaluated and they found that opening the RELOC early, and using it strategically, greatly improved Monte Carlo Success Rates compared to leaving home equity as a last resort (Pfau 2016). pay off an existing mortgage in order to eliminate ongoing mortgage payments. create a monthly income stream (which if it minimizing IRA withdrawals, has the added benefit of reducing income taxes). finance a new home purchase. delay collection of Social Security benefits until age 70 in order to maximize their long-term value. minimize IRA withdrawals prior to age 70 & ½ which allows Roth Conversions to occur during these low tax bracket years. open a credit line as early as possible in a low interest rate environment so that as interest rates rise (and the credit line rises as well), eventually (if you live long enough) the amount borrowed will become greater than the home value. Since this is a non-recourse loan, you end up with more (in borrowed funds) than what your home is worth, thus walking away wealthier. As this strategy becomes popular, it is likely that this opportunity will be eliminated via new FHA and HUD rules. What Are the Downsides of a Reverse Mortgage? There are downsides to a reverse mortgage that must be considered carefully. Most HECM’s have a variable interest rate which can rise and increase the balance owed more quickly. They are expensive (relative to a HELOC) and complicated. If you leave the home within just a few years, it would have been better to avoid the upfront costs of the reverse mortgage. The costs are not trivial when compared to a traditional mortgage or HELOC. Heirs may be irritated as they may have been hoping to have inherited a house free and clear. However, as the research mentioned above shows, correct use of a reverse mortgage increases the chances that total remaining wealth ends up being larger. Who are the Best and Worst Candidates for a Reverse Mortgage? The best candidates are those with other investments, a desire to remain in their home, and can afford to maintain the home and pay taxes and homeowner’s insurance. Also, the best candidates are those who are between age 62 and 70 and are on track to be house rich and cash poor as shown in the image above. If the candidates wait until they have few investments left, the strategic value of the HECM will be lost. The worst candidates for a reverse mortgage are those who are desperate and need to take it as a last resort. They may have no other investment assets, so they may end up using their only remaining asset for lifestyle related expenses rather than maintaining the equity for a potential long-term care need. In this case, it may be better to trade down to a less expensive home, or even rent. If you don't plan on staying in your home for more than 3-5 years, the up-front costs won't be worth it and a reverse mortgage is not for you. As you can see, it is indeed possible to spend down your home, like you would an IRA. This would be the home you want to remain in for the rest of your life. The reverse mortgage can help with cash flow for repairs and medical costs as you age in place, or used more strategically to build wealth. If after reading this, you find that a reverse mortgage meets your needs and lifestyle objectives, it could be one way to increase income during your retirement years. However, because of the costs and complexities involved in a reverse mortgage, you should weigh your options carefully and consult with a professional who can explain the full implications. Let’s get a few of the myths out of the way, so that readers can continue on without these questions in the back of their minds. You can't get a reverse mortgage if you currently have a traditional mortgage. Yes, you can refinance the traditional mortgage into the reverse mortgage. When you take a reverse mortgage, you lose title to the home. You retain the title of the home until you sell the home. If your house falls in value and the loan is greater than the value of the home, your heirs will have to come up with the difference. A reverse mortgage is a non-recourse loan and therefore, regardless of the loan amount or whatever happens to the value of the home, you will never owe the bank more than the value of the home itself. After your death, the house goes to the bank. After your death, the heirs own the home and can either keep it (and pay off the loan with other funds) or sell it (and pay off the loan with the sales proceeds). The bank will choose the selling price and sell the home. The heirs will set the price, hire a realtor, and sell the home. Once you get a reverse mortgage, you can never move. You can move anytime, and must then pay off the loan balance and accrued interest. All reverse mortgage lenders prey on the elderly who have no other options. Of course not, and in fact the ideal borrower is one that is not getting the reverse mortgage as a result of having no other choice.